Hanover Engineering assisted with the development of a 15-mile gas pipeline project in Tioga County near the Pennsylvania/New York state border. The gathering line connects several midstream systems into a new point of sale. 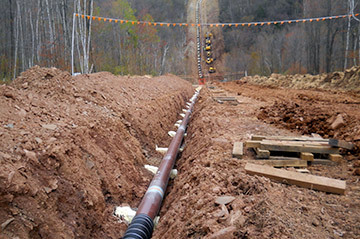 Natural gas from a multitude (potentially hundreds) of Marcellus gas wells will be transported through this pipeline to a transmission pipeline. The rugged terrain and numerous water features, along with specific property owner requests and endangered species and cultural resource conflicts, made this pipeline a considerably challenging project to design and permit. Due to scheduling demands and conflicts with threatened and endangered species, the project was separated into three phases to enable the construction of a significant portion of the pipeline while the approval of the remaining phases was contingent upon the requisite threatened and endangered species clearances. This phasing of the project allowed the client to adhere to contractual obligations and meet critical construction deadlines.